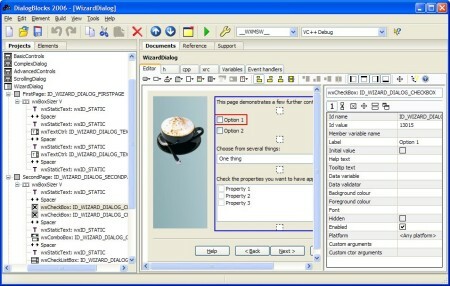 These images are clickable, to show a bigger version. We hope you like what you see. If so, please download the demo and see it for real. DialogBlocks under Windows XP, showing the project view, dialog editor, and output window while compiling wxWidgets. 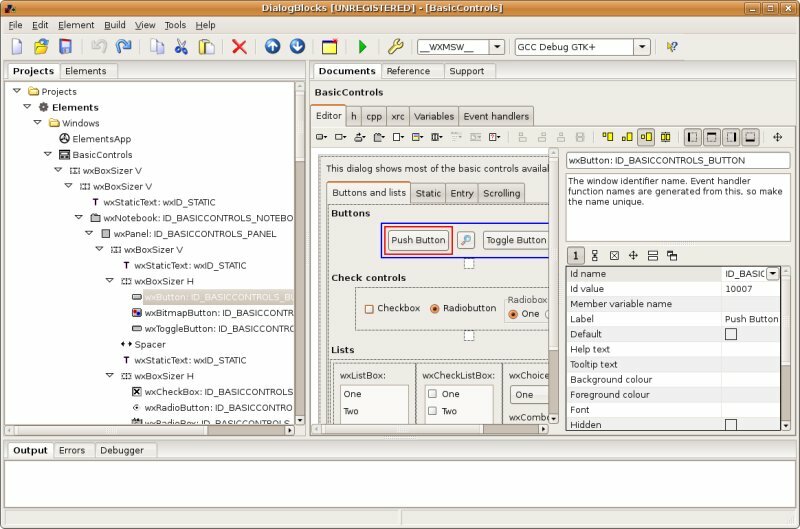 DialogBlocks under Windows Vista, showing the Element selector. 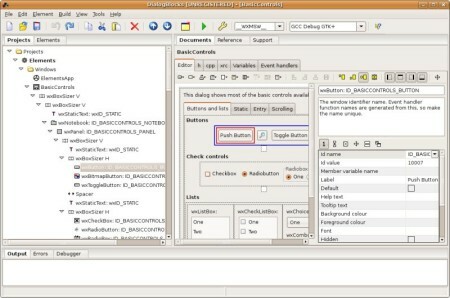 DialogBlocks under Ubuntu Linux, showing the project view, dialog editor, and output window. 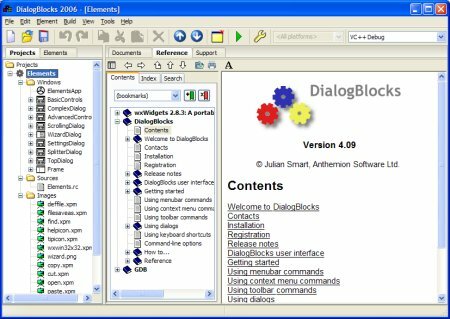 DialogBlocks under Mac OS X. Editing a wxAUI wxFrame. 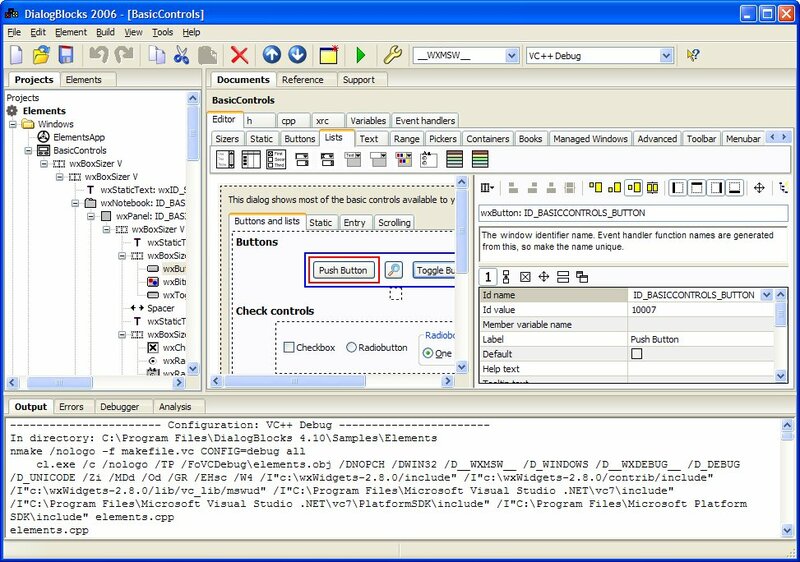 DialogBlocks supports wxAUI layouts on frames, dialogs and panels, controlled by a set of properties on a separate property editor page. 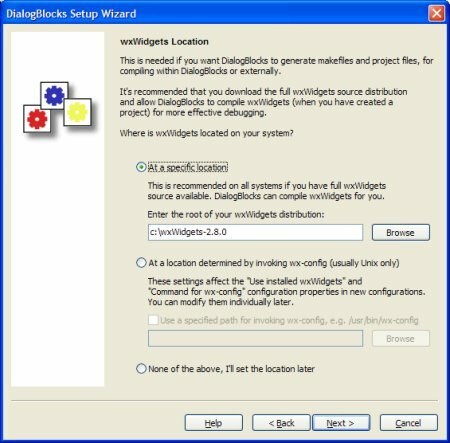 DialogBlocks also supports the wxAuiNotebook control. 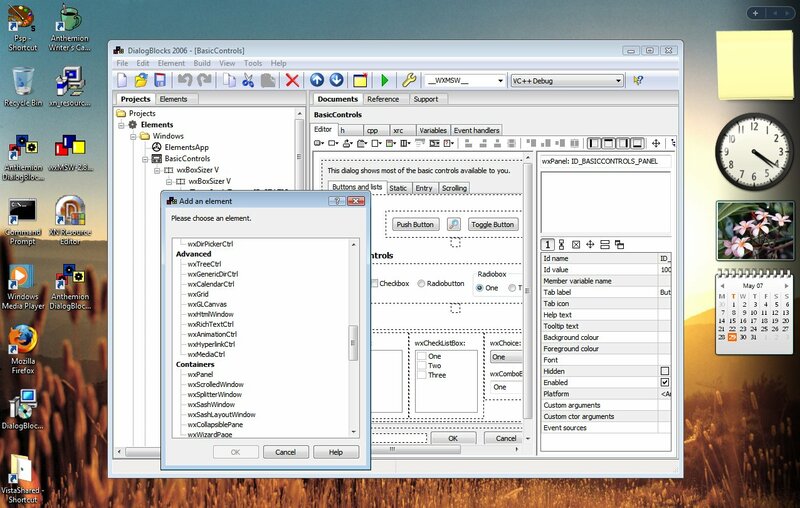 Editing a build configuration, used to build projects and the wxWidgets libraries. 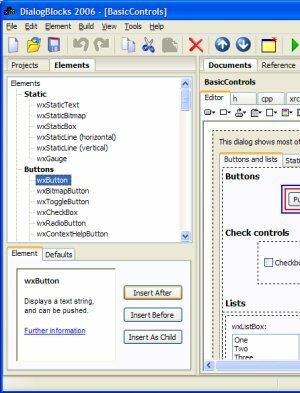 DialogBlocks supports most popular compilers: it generates makefiles and invokes the compiler and (if successful) runs the built project, all by pressing the green button on the toolbar. 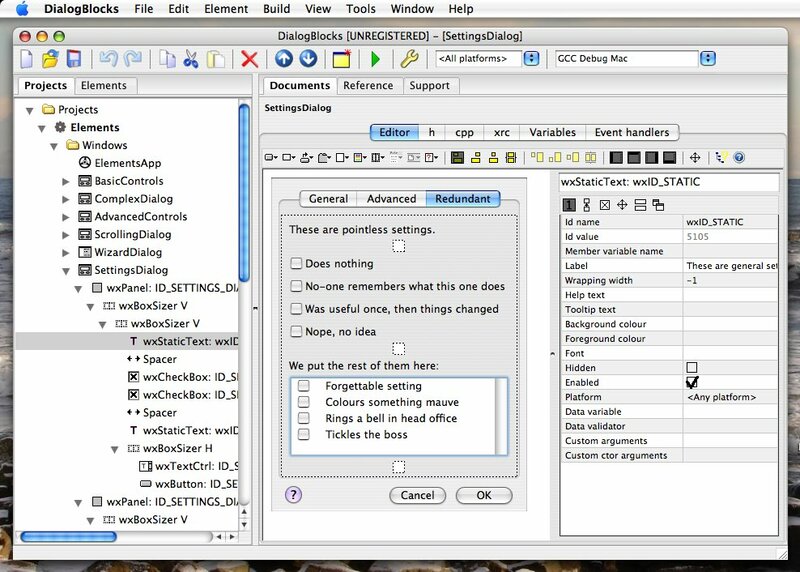 Editing a wxWizard. 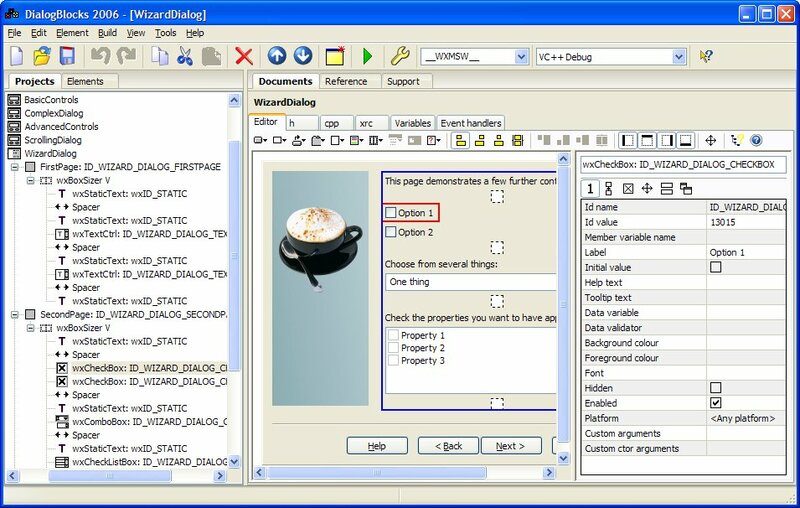 Unlike most other GUI editors for wxWidgets, wizard pages are edited in-situ rather than being edited separately and combined by user code. 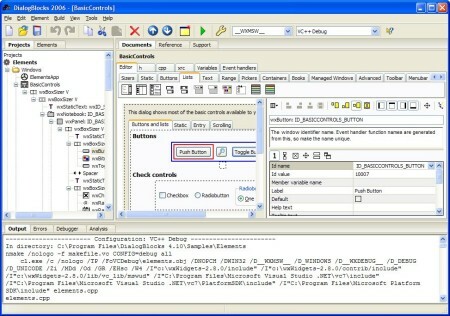 DialogBlocks can also edit notebooks and property sheet dialogs in-situ. The built-in documentation viewer for browsing DialogBlocks help and the wxWidgets reference. 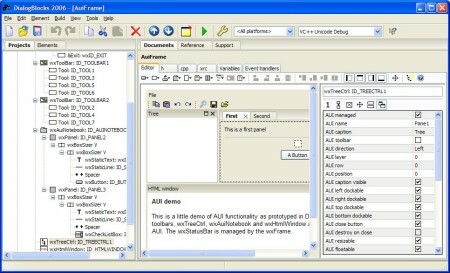 The element catalogue provides an alternative method of inserting windows and sizers. You can specify default values for common properties, for example if you usually insert box sizers with no borders. 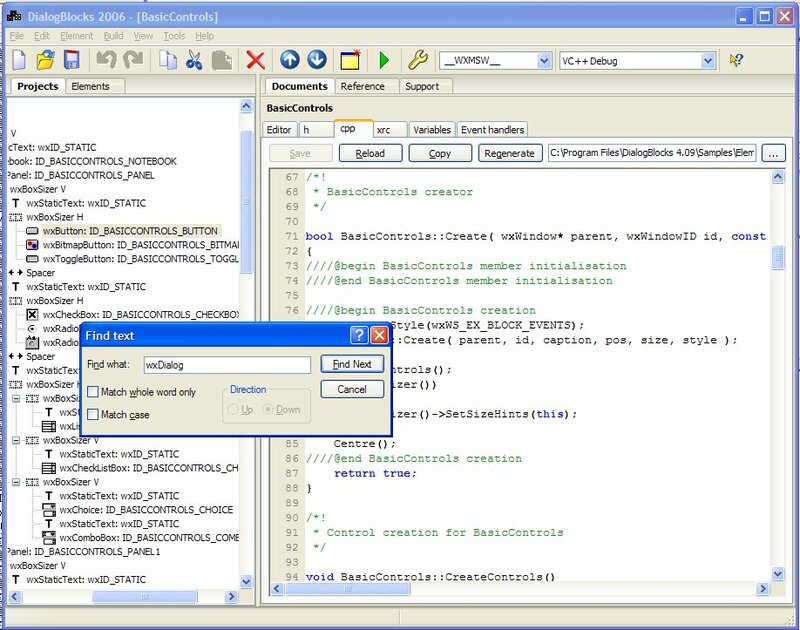 DialogBlocks provides a basic code editor for C++ and other files, with customisation for tabs and highlighting colours, auto-indent and more. You can also edit your files in an external editor or IDE, and DialogBlocks will reload changed files as appropriate. 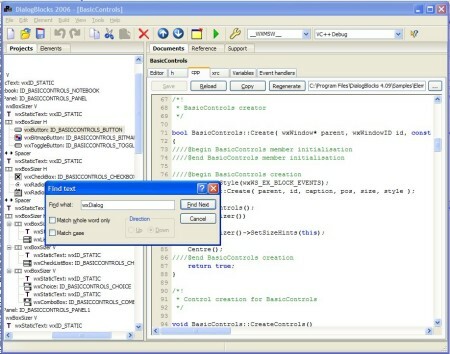 You can edit the code that DialogBlocks generates, outside the special comment blocks. 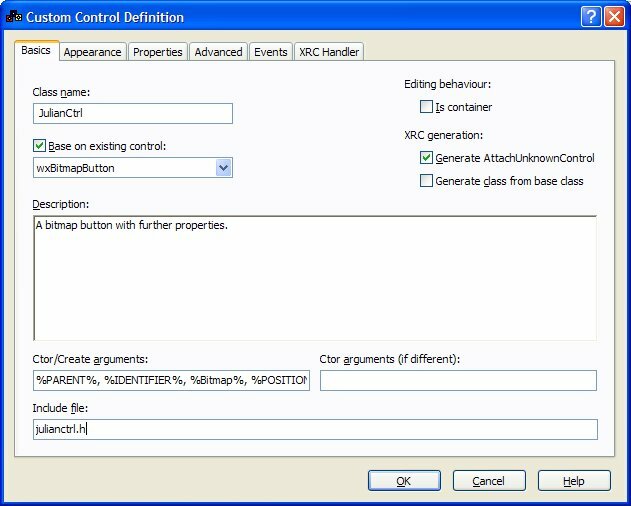 You can create 'custom control definitions' which tell DialogBlocks a bit about how third-party controls behave, to make editing and code generation more accurate (it won't insert the actual external control). You can optionally base the definition on an existing wxWidgets control and inherit its properties. 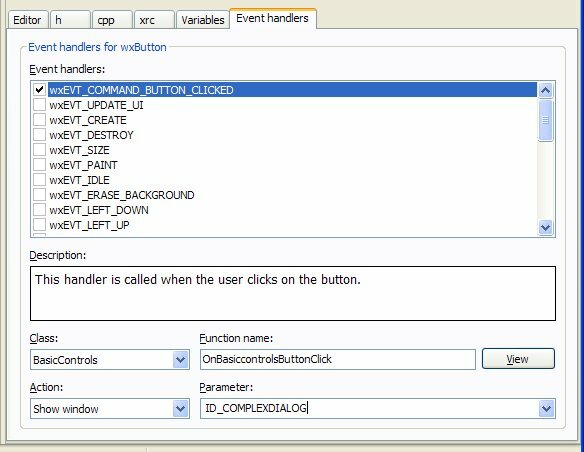 DialogBlocks can add event handlers, for you to fill in the details in the stub function. 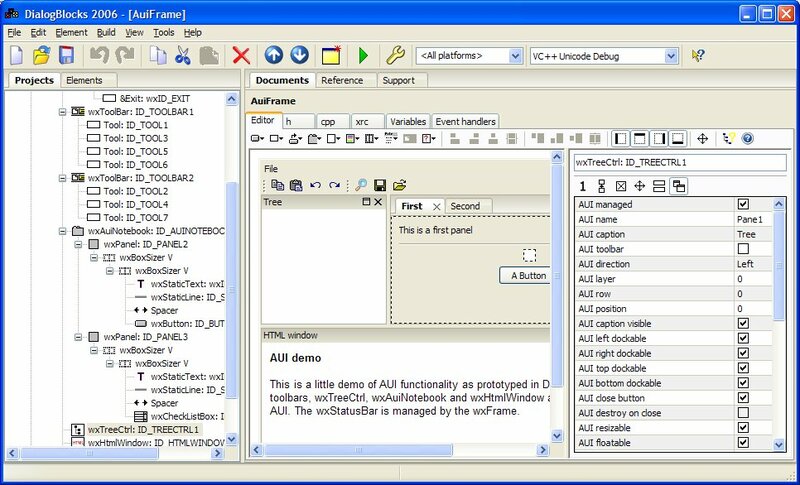 You can also choose from a small number of predefined actions such as showing a window, and DialogBlocks will generate the appropriate code. 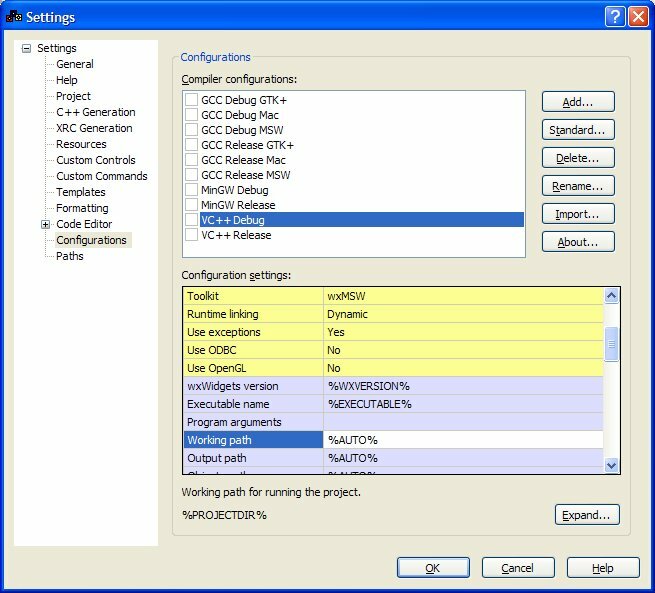 This helps you create a working prototype very quickly. 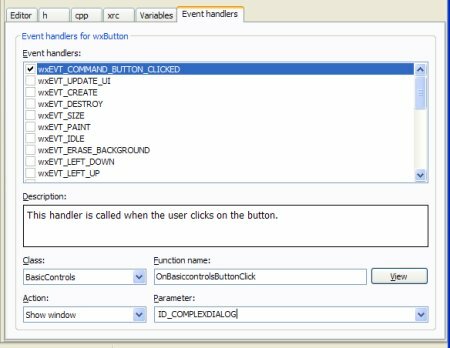 A setup wizard run on first running (and optionally later) will gather commonly-needed information such as wxWidgets location and version, and will make an initial guess at compiler locations.